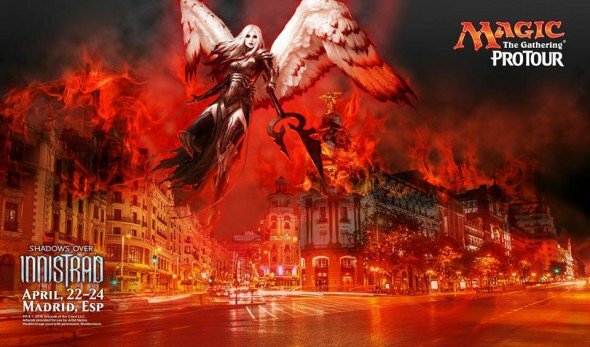 In the stunning city of Madrid, Spain an excellent weekend of Magic: The Gathering Pro Tour action is in motion. Coming off the results of the last couple of weeks on the SCG circuit, the pros have been tasked with addressing a Standard metagame that has so far been dominated by Wx Aggro and Bant Collect Company decks. Quick starts, and curve toppers Archangel Avacyn and Archangel of Tithes have made answering the aggressive decks difficult, as has the lack of definitive and timely sweeper spells. Nevertheless, after weeks of secretive testing, the top pro teams from across the globe have gathered for another epic quest to take home the trophy. With over $250,000 USD on the line, and the winner taking home a hefty $40,000, players will be hard pressed to overcome the deep pool of talent. The Pro Tour, of course, requires players to succeed in a mixed schedule of booster draft (SOI – SOI – SOI) and constructed play (Standard in this case) with 3 rounds of draft Friday morning, followed by 5 rounds of Standard starting around 7am EST. For the MTG Finance community, the question of the day is which decks will rise to dominance today in a field that has seemed close to being solved fairly early on. Will any of the pros find a way to unlock a new archetype with game against the known field? Will an underplayed deck from the previous weeks results suddenly end up perfectly positioned after adding a few new pieces of tech? Will there be a chance to get in on a must-have card that shows early promise or will the hype train leave the bandwagon speculators out in the cold without buyers come Monday morning? Thus far Shadows Over Innistrad has behave a bit oddly vs. other sets from the last few years, with a full ten rares and mythics holding price tags over $10 a couple of weeks after the set first hit the streets. Archangel Avacyn is the current queen of the format, commanding a consistent $45 at retail, and showing up as a 2-of to 4-of in many of the best performing deck lists. Declaration in Stone is going for $15, an incredible value for a rare kill spell in this format. Meanwhile, much hyped rares Thing in the Ice and Westvale Abbey have peak in the high teens only to fall back towards $10. Let’s take a look at some of the cards most likely to make a move this weekend. Arlinn Kord: Stuck on the bench? Despite plenty of early excitement from the Werewolf fans, Arlinn has mostly been left out of the action thus far at the top tables of Standard. With white set up as the de facto best color in the format, and other top decks configured to run Bant or Izzet color schemes, the green/red planeswalker has struggled to make an impact. The winning GR deck at the SCG Standard Open last weekend failed to field a single copy of Arlinn. At $20, a failure to make waves this weekend should set Arlinn on a path to collapse back towards $10. Plan accordingly, but keep any eye out for a list in the top ranks that runs multiple copies, perhaps in the form of a Jund mid-range list alongside the Gitrog Monster ($6), which could likewise top $10 on a successful showing this weekend. Nahiri, the Harbinger: Time to Shine? On the other side of the numbers we have a planeswalker that may turn out to be much better than anticipated. Already popping up in lists like KikiChord in Modern as a 2-of, there is every reason to believe that there may be a configuration in Standard that wants to run multiple copies into a trophy position. If that were to go down, Nahiri could easily swap prices with Arlinn Kord and provide savvy speculators with a potential double up. Sylvan Advocate: Ubiquitous on 2? Once available for $2, many players utterly missed how powerful and important a 2-drop that became a Tarmogoyf in the mid-game would be in Standard. The bonus this elf gives your creature lands is just the icing on the cake. This Oath of the Gatewatch rare has already topped $5, but a dominant showing in 50% of the Top 8 decks might be enough to push demand up towards $10 as players conceed to the necessity of running three or four copies. Jace, Vrin’s Prodigy: Can He Hold the Line? Player consensus a few weeks into the new Standard seems to be that Jace isn’t as good in a format without fetchlands and without popular decks capable of filling graveyards quickly. That being said, he is still showing up in both UR Goggles builds as well as in some Bant Company lists. The real question however is whether Jace will be able to hold a $70 price tag heading into rotation in the fall. My gut says the card will fall to $40 or so in late summer, bouncing back over $50 within the year. As such, if you have non-foils you aren’t playing, you may want to think about trading out now, and getting back in down the road. Foils may also show weakness this year, but as the card is playable all the way back to vintage, you can likely hold those for the long term without much fear. Archangel Avacyn: Still Flying High? Avacyn has started this season off as the most feared creature in the format, a flying beater that can mess with combat, save the team, clear the board and certainly finish the game. At $45, she is certainly priced for continued success, so if the metagame managed to swerve around her and keep her from the top tables, her price would be prone to a slide. Given what we’ve seen so far however, white is the color of the season, and the odds are very good that Avacyn will earn her keep in the Top 8. Demonic Pact: Ready to Rogue? This card has jumped by 100% this week on Magic Online, and rumor has it that an Esper enchantments list running four copies of this powerful mythic alongside multiple copies of Starfield of Nyx has been testing well. I would be surprised to see more than a handful of notable pros run a deck like this, but no one saw UR Eldrazi coming at PT Oath of the Gatewatch either. As a $2 mythic, strong performances into Day 2 on camera could easily trigger rampant speculation, pushing this card over $6. Starfield of Nyx is available under $3, and is an easy favorite to top $10 down the road on casual demand in enchantment flavored decks. I like Starfield as a pickup immediately, and will be ready to move in if Pact shows up on camera this weekend. Stay tuned for Round by Round MTGFinance coverage of Pro Tour: Shadows Over Innistrad all weekend! Jace Vryn’s Prodigy may well stay expensive after rotation due to price memory, but good luck finding any buyers at $50. For crying out loud, Harbinger of the Tides, a $2 rare from the same set, sees more Modern play. No one is playing him in Legacy, either. He’s great in Vintage, but that has absolutely no impact on prices for non-foils.